This software is not guaranteed. Please use at your own risk. The directory is selected, this extension is list files that exist in the directory. When directory1 is selected, hoge.html and hoge2.html are listed. The extension of the file. If the file have no extension, like "README" , this item is not filled. If the file is not html(jpg,gif,pdf...), this item is "___NO_ITEM___". If the file is html file, and have no title tag, this item is "___NOT_DEFINED___". If the file is html file, and have title tag, but like "<title></title>" , this item is not filled. The Path of the file. If URL of the file is http://hoge.com/hoge/hoge.html, this item is "hoge/hoge.html"
The link to the file. If URL of the file is http://hoge.com/hoge/hoge.html, href of this link is "hoge/hoge.html"
So, please save the list in the root path.(Ex. /pagelist.html).When saving it in another path, the links are broken. Last modified date of the file. Last modified time of the file. If the file is html file, and have no meta tag(name="keyword"), this item is "___NOT_DEFINED___". If the file is html file, and have meta tag(name="keyword"), but like '<meta name="keyword" content=""' , this item is not filled. If the file is html file, and have no meta tag(name="description"), this item is "___NOT_DEFINED___". If the file is html file, and have meta tag(name="description"), but like '<meta name="description" content=""' , this item is not filled. Insert into the current document. Those formattings are customizable and be able to save. This command generate Text-based list that include only path of file. This command generate Text-based list that include only filename of file. 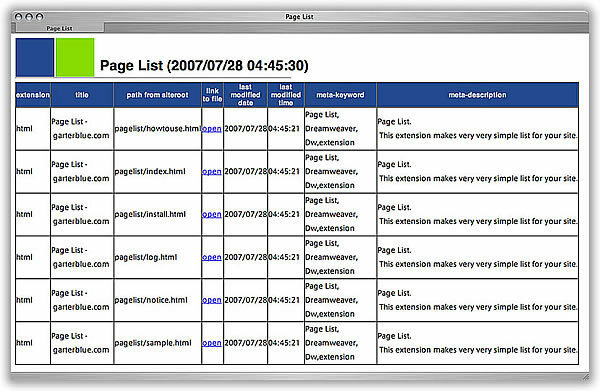 This command generate Text-based list.You can customize it. 2way to make the list. "make Page List" and "make List Anything".